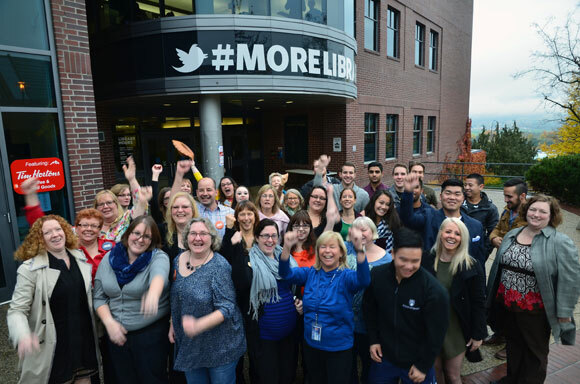 UBC students and staff cheer results of the student union #MoreLibrary yes vote referendum, which will help fund an expansion that will more than double the space of the campus library at UBC Okanagan. Students at UBC’s Okanagan campus have voted to partner with their university to create a major new space on campus for study, collaboration and services to meet their needs. In a referendum this week, 85 per cent of voting students said yes to a project that will add 45,000 square feet of dynamic, technologically enhanced learning space, more than doubling the size of the existing library. Students approved a $70 annual student levy to fund one-third of a project valued at up to $30 million, depending on final configuration of the new space. “We are tremendously grateful to our students for their vision and commitment, and we’re excited about proceeding on this project in partnership with students,” says Deborah Buszard, UBC deputy vice-chancellor and principal of the Okanagan campus. Funding from students will effectively be tripled by other funding sources which can now be pursued with a strong mandate to proceed, says Buszard. Expansion of the existing 650-seat library will have a tremendous impact on the student experience, says Rocky Kim, president of the UBC Students’ Union Okanagan (UBCSUO), which held the referendum. “The financial contribution of the students towards the library reaffirms the UBCSUO's position that this is in fact a necessity,” says Kim. “It is my hope that our contribution will trigger additional sources of funding to follow in our example and join us in building UBC Okanagan for the better."